Not sure there would be much interest but figured I would test the waters, I have been using straights for about 18 months and about 4 months ago took to learning to hone and its been great, I have learned a ton from seasoned "Honemeisters" ( Thanks Doc226) and tried various edges from synthetic to natural and have decided after lots of trial and error I prefer natural. 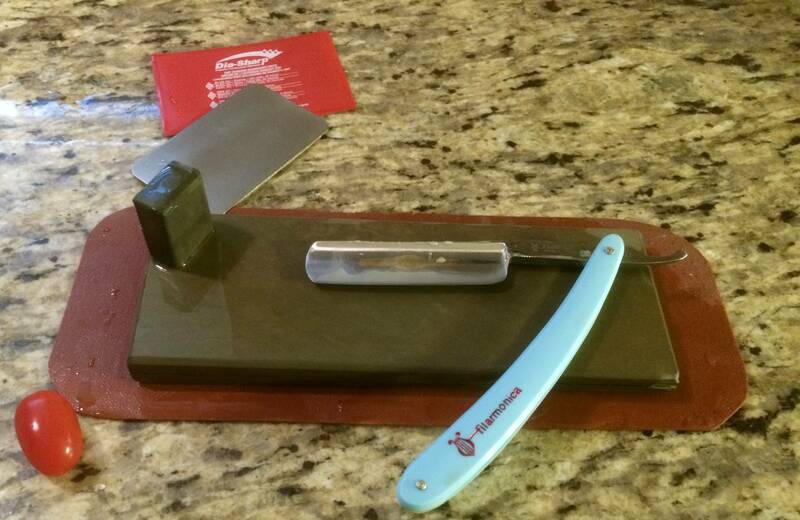 So with that said I figured I would start a thread called "What did you hone today" and see if it takes off and maybe you "Honers" out there can post up pics of your daily honing session whether it be a razor, pocket knife or kitchen knives but since it in the straight razor section of the Nook hopefully we will not see only those pretty stones I know you guys have but also those razors as well. Here was my choice for today, Not that it needed it but was having some honing withdrawals so joined the edge on this Jahns Jewel and then reset the bevel on the 5K then went to the 8K Suehiro and finished off on the Nakayama Asagi Tomae first with a #600 DN slurry then a tomonagura slurry thinning down to a light mist. Nothing fancy. One my favorite straights, an Ali's Blade, started to tug a little. 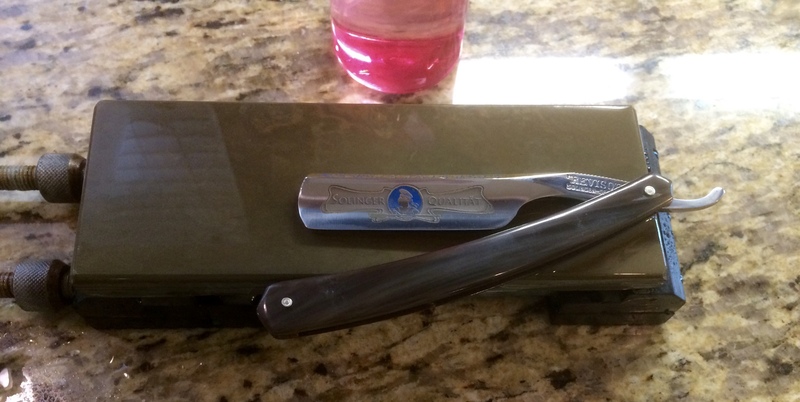 Ten laps on the Naniwa 12k, then 35 on the Suehiro 20k, yielded a very smooth, enjoyable shave this morning. (01-30-2016, 03:38 PM)evnpar Wrote: Nothing fancy. One my favorite straights, an Ali's Blade, started to tug a little. 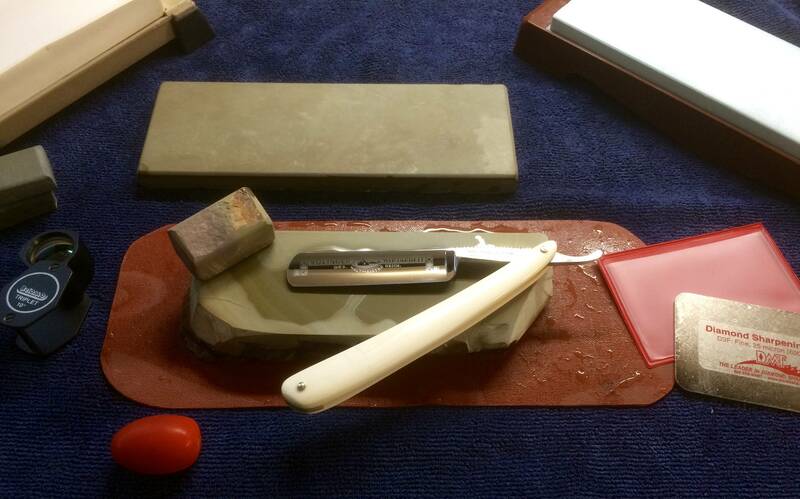 Ten laps on the Naniwa 12k, then 35 on the Suehiro 20k, yielded a very smooth, enjoyable shave this morning. Glad to have you join in hope it catches on, it's always nice to hear what others use for a honing progression. I had 5 in for honing this week finished them off yesterday all were in for the full works bevel set right up the progression, Chosera 1K, Chosera 3K, Chosera 5K, Naniwa Snow White 8K, Naniwa 12K, Suehiro Gokumyo 20K. (01-31-2016, 03:35 AM)Jamie Mahoney Wrote: I had 5 in for honing this week finished them off yesterday all were in for the full works bevel set right up the progression, Chosera 1K, Chosera 3K, Chosera 5K, Naniwa Snow White 8K, Naniwa 12K, Suehiro Gokumyo 20K. 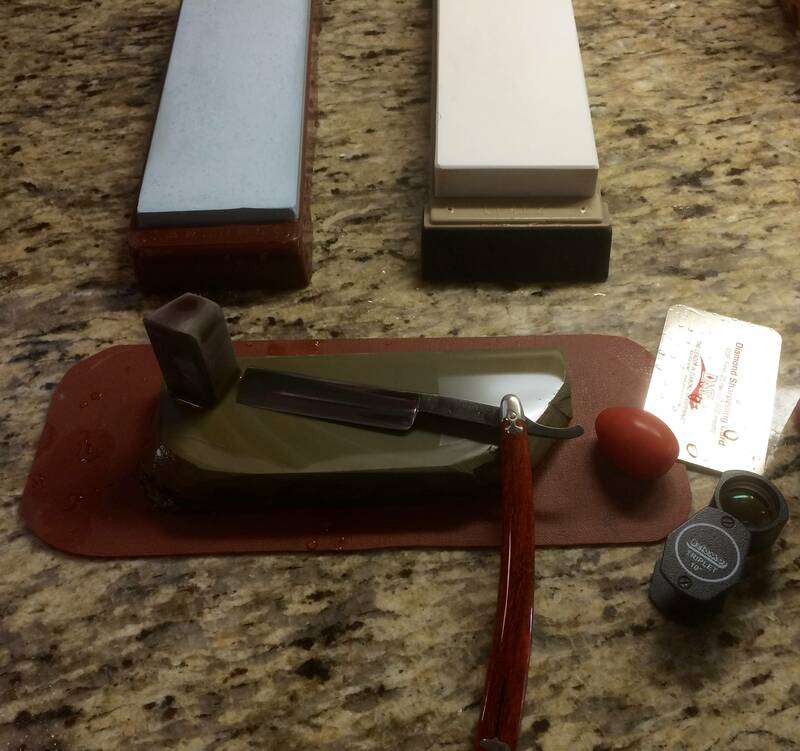 Today was an Otto Busch "Weltmeister" that was previously shave ready but I wanted to finish testing the Nakayama finisher that Alex G. sent me from Japan Stone, anyway joined the edge and then reset the bevel on a 5K then went to the 8K and then used a series of different tomonaguras to see what the edges looked like after coming off a DN slurry, still undecided on which tomo is the best but have decided to keep the stone. Shout out to a good friend here on the Nook, and Daniel Winkler ! Sharpened up the winklers! 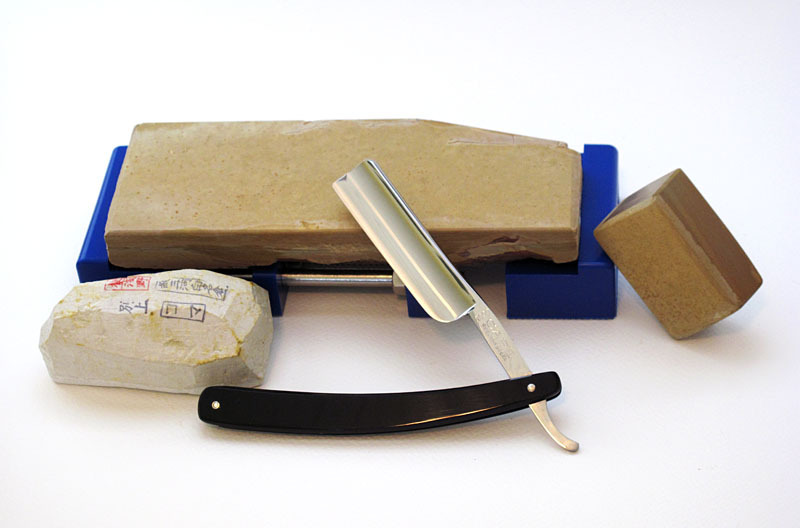 Hawk is polished to 12k and the belt knife has a 12k bevel but a dmt 600 microbevel. Sorry for the crap pic its best I can do. Yes FWIW I carry these 2 items everyday all day. Hawk is not a show piece or a safe queen she gets used. 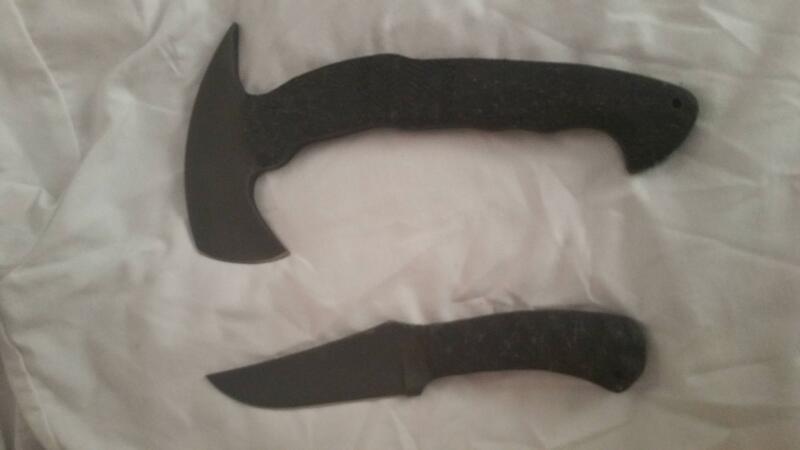 Very nice blades, I love the utilitarian look. Daniel is one of the nicest makers you could ever meet and that's what he goes for. Simple tools from the 19th century ,yet he's changed the ergo's and weight distribution so you have for instance the hawk all the weight is in the head and it's full tang . IIt's easy to handle and the balance is amazing. The belt knife feels like it's molded into your hand. People are put off by the price of these but I promise you the value is there. Daniel makes every piece and stands behind it 100%. He checks in on the knife and hawk as well. Asking me how I like it how well it does this and that. Then he takes the feedback he gets and puts it into the knives. I'd definitely recommend him if you have a role any of his tools could fit. Well today was a little bit of a challenge, I have tried and tried to master the rolling X stroke but always struggle so today I tackled it again with this Filarmonica Doble Temple which has a slight smile along with just a wee bit of uneven spine on one side, anyway I joined the edge on the side of the Okudo Asagi tomae then used a 5K-8K synthetic progression and finished on a DN slurry then tomonagura slurry. Went back to the finisher a few times as I was not happy with the toe (Thanks goes out to Alfredo Doc226) he has given me tons and tons of lessons via email, videos etc.... Anyway finally got done and the HHT was outstanding but we all know the shave is the real test. 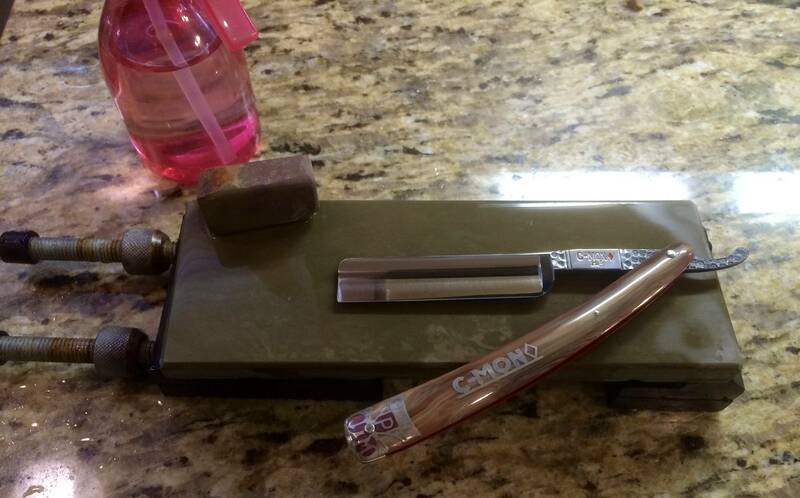 Honed up a worn kamosori that was in need of some TLC. I put it on a 5K hone to begin with and could see that the omote would be flat again by the time I got the bevel properly done. 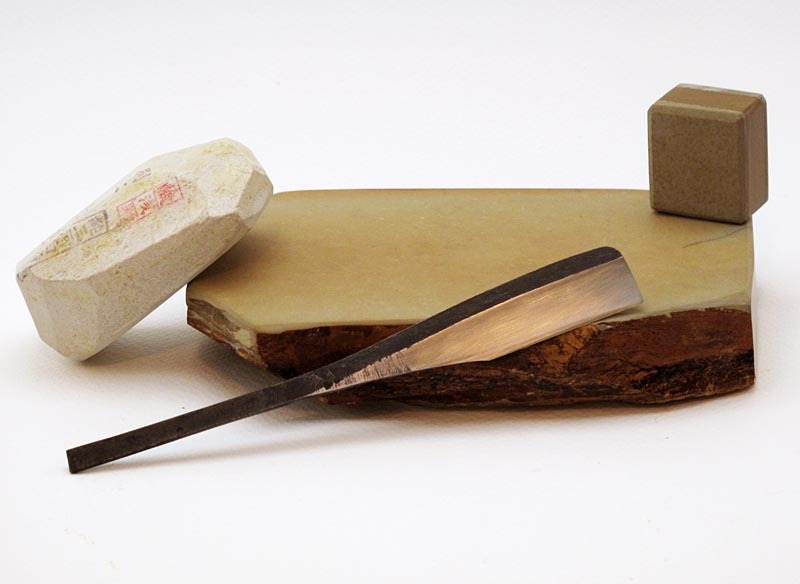 The omote (soft iron side) had been over honed by a good amount, so I reground the omote with sandpaper on a cylindrical form (bottle) of the right size with 80/180/320/500/1000 grit sandpaper to restore and finish the hollow. But this won't put missing iron back on the spine. Then I Sharpied the bevel and started adding tape until the hone was close to hitting the edge - 3 layers in all to make up for the missing soft iron. And off to the races. 2k and 5k Shapton Pro followed by koma and tomonagura on a Nakayama kiita. The bevels look good and it shaved quite well. 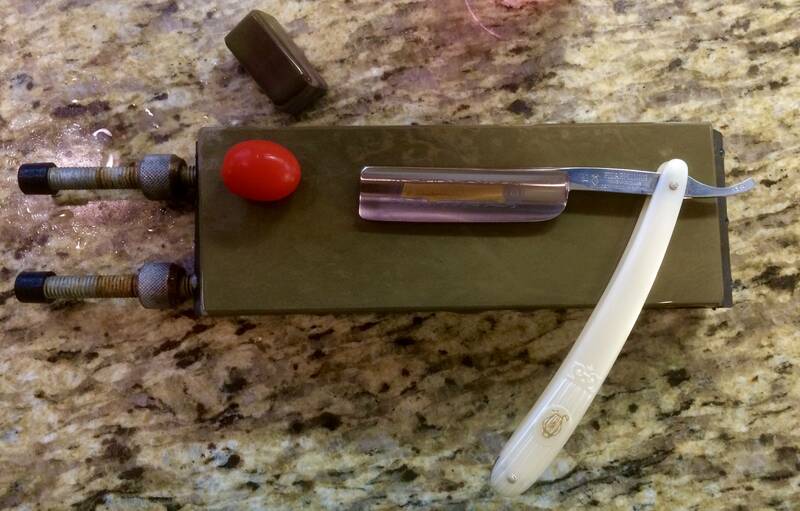 Okay, explain to me what that cherry tomato has to do with the bevel. (02-02-2016, 11:09 AM)Johnny Wrote: Okay, explain to me what that cherry tomato has to do with the bevel. well fast forward several months and I am a convert on using a cherry tomato, can't hone without them, Doc has been monumental in me learning to hone, he's taken time to answer email's, watch videos I have done and pointed out where I needed to work on my honing he is a true gentlemen. I have sent several blades to him for restorations and he does top notch work on top of honing, anyway I pretty much hone at least one razor a day when off and then shave with that razor the next day to see where I can improve and I always join the edge and reset the bevel using a cherry tomato and if it cuts thru it easily along the entire blade after joining the edge it's set and you can move on, if you want to try another honing method, try Alex Gilmores "Ax method", I did this after getting a few stones from Alex and it works like a charm, not the only method of honing and it does take away little bit of the zen by spending time on the stone but it works. Now obviously if a razor has issues like a smile or frown or some other geometry issues you are going to have to do other things but if the shaver is in good shape you should have no issues, heck I have even set a bevel and finished on the same JNAT, not as quickly as Doc but did it none the less and the shave was very, very good. Love the looks of that stone, and Alex is a super guy to work with, i actually need to start looking for a mid-range JNAT. Today I was little bored so I joined the edge on this Le Grelot "Royal Canada" and then did a 600 DMT slurry and then two different tomo progressions. (02-07-2016, 09:24 PM)Panther308 Wrote: Love the looks of that stone, and Alex is a super guy to work with, i actually need to start looking for a mid-range JNAT. If you want to try something on the cheap first, ask Alex for a piece of the white ungraded Mikawa nagura from Yamimoto-San. Fast, fine and quite a decent mid-range option for not a lot of bucks. I will do just that, thanks for the tip !! 6 in today 1 Dovo 2 TI's 1 Revisor and 2 old Sheffields all in for honing plus 2 them for a new set of scales as well.